Sony Crime 2 and Scuzz have fallen foul of low viewing figures and declining advertising revenues. Columbia Pictures Corporation Ltd, the legal entity that operates Sony-branded and other niche channels in the UK, pulled both channels from Sky at 9am this morning. Both channels only had limited distribution via Sky, both recording very low audience shares of 0.01%. Sony Crime 2 was only launched in February 2018, when it took over the reality crime programming previously shown on the now defunct True Crime channel. The main Sony Crime channel launched in place of Sony Channel on pay TV platforms and True Crime on free-to-air platforms. But with sister channel TruTV UK adopting a more crime-dominated schedule, Sony Crime 2 duplicated what was being broadcast elsewhere. Rock music channel Scuzz launched back in 2003, but has become the latest music channel to suffer from changes in viewing habits, new music streaming options, alongside a difficult advertising market, which is affecting revenues across the industry. 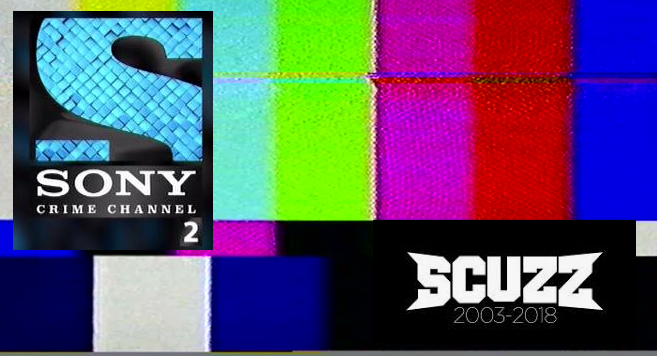 Originally, Scuzz was part of the CSC Media group of channels, before falling under the umbrella of Columbia Pictures Corporation Ltd - aka Sony. The close-downs form part of an ongoing project by the company to review its large portfolio of niche entertainment channels, closing down channels, merging channels and launching new channel brands across free and pay TV platforms. Music channels have been failing at a rapid rate in 2018. Twenty years after digital television began to facilitate the launch to specialist television channels, the efficiency of the internet to distribute specialist content at a low cost has resulted in numerous broadcasters pulling the plug on linear TV outlets. Last month, Global closed Heart and Capital TV. Viacom axed free-to-air VIVA at the end of January. In September, Vintage TV fell into administration after the money ran out. And two weeks ago, Massive R&B was axed, with its owners deciding they had a better chance of using the slot to cater for country music fans via the new Total Country channel on Sky and TVPlayer. While some channels have closed, others have opted to adapt and morph into general entertainment channels, with 4Music and VH-1 UK making the genre switch in 2018. Meanwhile, Sony Crime 2 was part of a glut of crime channels that have popped up across the TV landscape in recent years. The merger of the entertainment and factual genres on the Sky EPG has enabled crime channels specialising in a mix of UK/US crime dramas and real-life documentaries to prosper. A genre that was once just catered for by the Crime+Investigation channel is now super-served through the main Sony Crime Channel, TruTV UK, YourTV, CBS Reality and Sky Witness.